Back again for 2018 our very own Captain Cut Loose Louis Parkinson Climbing will be joining us. For those who aren’t up to date with his aerial antics here is a bit more on him. Louis Parkinson is a boulderer, competition climber and coach based in London, England. Known for his boundless enthusiasm for climbing rather than actually being good at it, Louis has achieved notoriety for his entertaining videos showcasing the strength and power he has inadvertently developed by lacking decent climbing technique over the last decade. Over the last few years, Louis has split his time between competing, training indoors and climbing on actual rocks whenever he gets the chance! 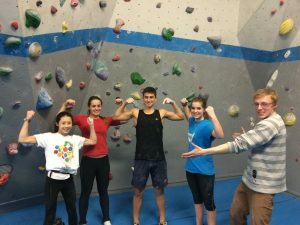 In competitions, Louis has won the British Universities Climbing Series, the very first Beastmaker International Footless Festival, the Blocbuster Competition at Depot Nottingham, the Castle Climbing Centres 20th Anniversary competition, and made it onto the podium many times at the annual Blokfest Competition Series. 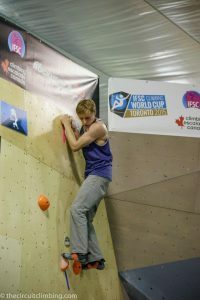 He has competed at the IFSC Bouldering World Cup in Toronto and Vail, as well as the Hardmoves competition in Dusseldorf. In short; Louis really likes competitions. Louis has also managed to get a decent amount done on real rock considering the lack of cliffs and boulders in England’s capital. He has climbed 8A boulders on the Gritstone of England, the Gneiss of the Rocky Mountains and Magic Wood, where he also completed his first 8B boulder. Despite being known for his power, Louis rarely focuses on helping people to build strength during his lessons. 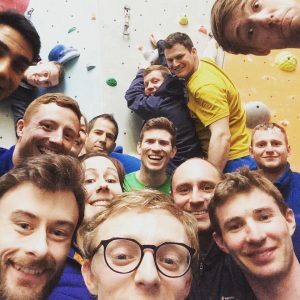 Louis teaches efficient climbing and an open-minded approach to problem solving and how to measure progress in a way that makes it easy to maintain long term motivation.